This spare, elegiac memoir about Robert Mapplethorpe and Patti Smith has something of the Christian iconography about it: if words were installations, one can imagine an altarpiece with the Virgin Mary and perhaps a crucifix surrounded by velvet, feathers, bits of lace, and little skull beads…not kitschy, but strong, puzzling, edgy. Patti Smith is a force, though perhaps one might say she is the negative to Mapplethorpe's positive in the first part of the book: the black negative to Mapplethorpe’s clear clean photograph. In the last half of the book, Smith herself is the positive and lighter image, and entirely clear. And what an unforgettable picture it is. Smith and Mapplethorpe were soulmates, and she accepted him unconditionally. That closeness and lack of criticism gave them both room to develop in a environment of mutual trust. Even if Smith didn’t agree with, nor completely understand, the impulses that ruled Mapplethorpe she was his first proponent. She grew into her own art even as it grew in her. She was often unsure of the work, but not of the path. By now she might be considered a swami for the equilibrium she exhibits in writing this book. Amerigo is the first song on her new album, Banga, out in 2012, and in it she says “they called us Caribe, which means men of great wisdom…” Perhaps only now can she say that, but she has earned it. I loved reading of those moments when one change (in appearance, friends, or piece of art) made an enormous difference in how Smith or Mapplethorpe were perceived. She makes it sounds like a chemical reaction–that moment a salt solution becomes crystal. Her sound is even better for my knowing her history. A life in the pursuit of art is something extraordinary, and this telling of it is breathtakingly lovely and clear and spare. Not the life, especially, but the telling of it. Perhaps Mapplethorpe and Smith were destined to meet, but imagine for a moment they did not. Smith was perhaps the less fragile. We can’t help but wonder at the path they took and how, necessarily influenced by externals as we all are, things would have been for them in a different constellation. Great read. It feels like a long time since I’ve read such an accomplished novel. 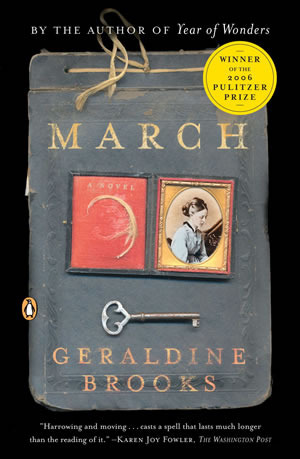 Geraldine Brooks manages to catch the horror of war in a phrase: “…[men] were clinging [to the rocky bluff over the river] as a cluster of bees dangling from a hive, and slipping off in clumps, four or five together.” Her characters are so richly drawn and steeped in a historically accurate language that we feel transported, and are eager to delve into our own researches. In this novel she recreates the environment of one of our most beloved and earliest American writers, Louisa May Alcott. But instead of walking on furrowed soil, she moves back to imagine Alcott’s father, using his own journals and those of his friends, as well as the journals of Civil War chaplains, soldiers, medics, and slaves. She chose an unusual man, but she made him gracious, sympathetic, fallible, generous, and loving. This is essential to carry us through those bitter days of the Civil War, for we need a man willing to mull over events of that time but also to guide us. …I had come in stages to a different belief about how one should be in this life. I now felt convinced that the greater part of a man’s duty consists in abstaining from much that he is in the habit of consuming…None in our household ate meat but now we learned to do without milk and cheese also, for why should the calf be deprived of its mother’s milk? Further, we found that by limiting our own consumption to two meals a day, we were able to set aside a basket of provisions from which the girls were able to exact a pleasure far greater than sating an animal appetite. Once a week they carried the fruits of their sacrifice as a gift to a destitute brood of German immigrants. I laughed to read this, for the sincerity of the father must be the disappointment of the daughters. Part I is written in the voice of Captain March, chaplain of the Union Army. Though we learn the deepest secrets buried in his heart, we never learn his first name. Part II is written in the voice of his wife, Marmee March née Day of Concord, Massachusetts. The juxtaposition of the two voices shows us once again, should we need reminding, that gestures alone between husband and wife are often miscontrued and that we should try to give careful voice to our meaning and intentions if we wish the union to succeed. “Ragged scallop of cypress woods”, Jo's “lawless strands” [of hair], “a cold drizzle [falling] from heavily swagged clouds”: such phrases spike the book with rich flavor and bursts of color, and these are all Brooks. It is a masterpiece of historical reconstruction, but what I reveled in most was her smooth and seamless telling of the tale in backward glances and nineteenth century cadence and language, her use of metaphor, her rich imaginings, and its grounding in historical record. We can thank her for reminding us of our history and for remembering those men and women who left records of their lives and of our most uncivil war. For those contemplating the audio version, the narration by Richard Easton is magnificent. His reading's fluency of expression and elegance of tone mirrors the beauty of the text.